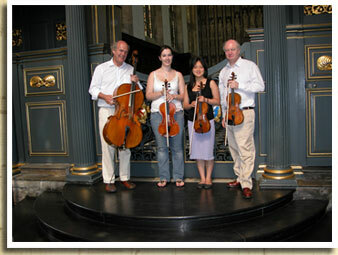 Oxford based specialist luthiers in instrument performance and tone production. Dealers and restorers. Beecher Acoustics. Beecher Acoustics has recently been featured in Ability, the journal of the British Suzuki Institute. Jonathan's first experience of the Suzuki method in 1971 - a thrilling and deeply and moving concert performed by children aged 4-12. This was the first time the Japanese Suzuki children had performed in the UK, and it was clear at this point that part of the secret of the children's beautiful tone was having responsive instruments from the very start. 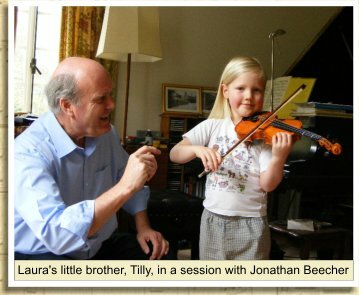 The beginnings of Jonathan's journey to discovering what makes a string instrument tick, and starting with the sound development of modest children's instruments. Jonathan's and Suzuki's shared philosophy on the potential for all children to have an enriched enjoyment of life through music. How Jonathan makes an instrument more responsive. Recently Beecher Acoustics has been exploring the inter-reaction of resonances in the string quartet, and is able to offer some remarkable innovations for the balance, clarity and power of the quartet, which enhances the character and effectiveness of the sound for the audience. In particular, the exact tonal setting of the viola forms a critical pivotal focus to the success of the overall sound of the quartet. We are offering quartets the opportunity to consult us to explore these issues. In our acoustically designed music room, we are able to adjust the individual instruments, and with the further support of recording, the players can hear the impact of the sound of their newly set up instruments. The acoustically designed music room forms part of the splendid new designs by our architect, Tim Beecher. The new facility has been the culmination of 4-5 years of planning and design, and two years of actual building work. Our site is on the edge of an ancient stone quarry, dating back to around the 12th to 13th century. Our land used to be the location for the original site office for the quarry. The stone from this quarry was used to build some of the earliest Oxford colleges. Our new building straddles the cusp of the old stone quarry cliff face that falls away more than 20 metres into the ground. The geological situation meant that the different stages of building were quite protracted, 84 piles going down to a depth of 7.5 metres, but with the added advantage that we have been able to build an air conditioned strong room in the basement for the storage of instruments. We feel the results have been well worth waiting for, as we enjoy not only the special music room, but also the new office, workshops and dust-free varnish room.